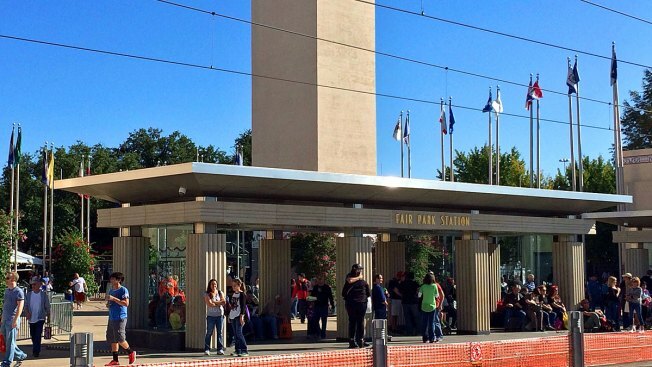 Fair Park Station during the State Fair of Texas, 2013. Dallas Area Rapid Transit has announced additional rail service in preparation for the State Fair of Texas, which opens Sept. 26. Expanded DART rail service begins Monday and runs through Sunday, Oct. 19, which is the final day of the annual expo at Fair Park. DART plans special rail schedules for Saturday, Oct. 11, which features the Texas vs. Oklahoma football game at Cotton Bowl Stadium. The Trinity Railway Express will also operate special weekend service during the State Fair of Texas. DART and State Fair of Texas officials say hundreds of thousands of riders have used the GoPass app to buy and display transit passes. This year fairgoers can also buy their general admission tickets with the same app.